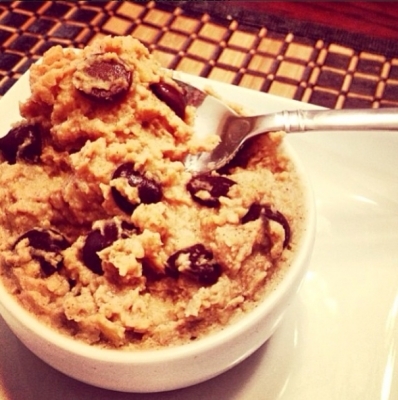 Perfect clean sweet treat, and tastes like actual cookie dough. Ingredients (for 1 large or 2 small servings)- 1/2 can chickpeas, 2 tbsp almond butter, 1 tsp vanilla, 1.5 tsp granulated (or regular) honey, 1 tbsp almond milk, 1/8 cup dark chocolate tips. Directions: Take skins off and rinse Chickpeas, add all ingredients to food process or express chopper (Ninja), add almond milk to mash and soften, then add chocolate chips to the mix.